Today I planted our lanky broad bean seedlings, into wonderful organic soil (all ‘made’ on the property). It was so good to get them in at last, and lovely to get my hands into the friable soil after months of cold! No sooner had I finished my work, than a sweet little robin appeared to check on things. I didn’t have my camera on hand to capture his inspections, but am hoping he wasn’t thinking I’d planted them too soon. Stay away Frost, please! What a beautiful day to bond with the living earth … Earth Day … with the sun shining brightly, the sky true blue, many birds making their cheery bliss sounds, bees and butterflies in evidence, and suddenly everything growing like crazy … Spring is certainly here. All of a sudden, there are huge amounts of work to be done in our garden, and I have no idea how on earth to manage the load, but the most wondrous thing of all? The first house martin appeared at my bedroom window this morning! For that, I felt the utmost relief and thanks. Swallows, swifts and house martins are amongst the many birds who are in severe and sharp decline. When they arrive, they come as a blessing, but their presence carries a sad and sharp message for us all too … we need to change our ways. What we are doing to the land is having a dramatic impact on the health of all creatures, and our cheery migratory friends are being sorely affected. With mindfulness and a change of attitude and action, we can each play our part to reverse this. Here’s to our bountiful Earth! 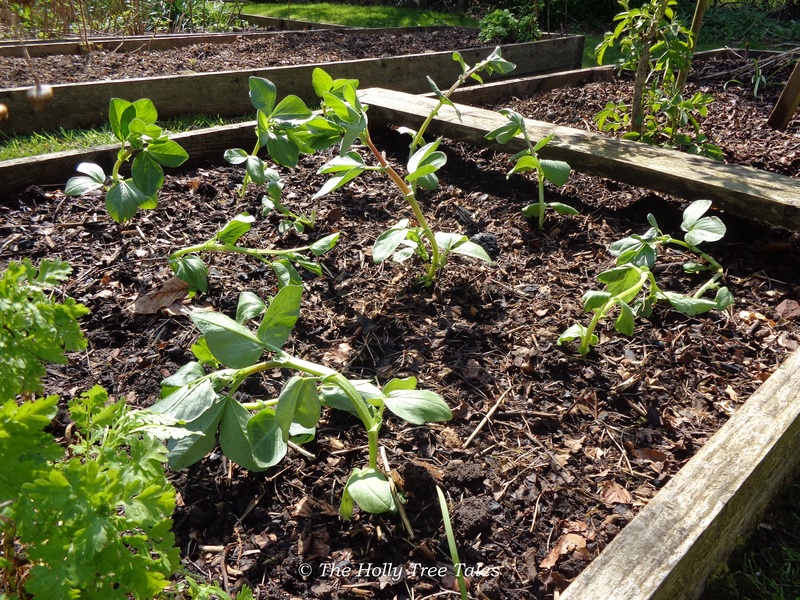 Spring planting of broad bean seedlings, into raised beds filled with homemade compost etc … beautiful organic soil ‘made’ on the property with many living, natural materials.